New network study: what are ‘good’ depression symptoms? Our new paper “What are ‘good’ depression symptoms? Comparing the centrality of DSM and non-DSM symptoms of depression in a network analysis” was published in the Journal of Affective Disorders (PDF). In the paper we develop a novel theoretical and empirical framework to answer the question what a “good” symptom is. Traditionally, all depression symptoms are considered somewhat interchangeable indicators of depression, and it’s not clear what a good or clinically relevant symptom is. From the perspective of depression as a network of interacting symptoms, however, important symptoms are those with a large number of strong connections to other symptoms in the dynamic system (i.e. symptoms with a high centrality). 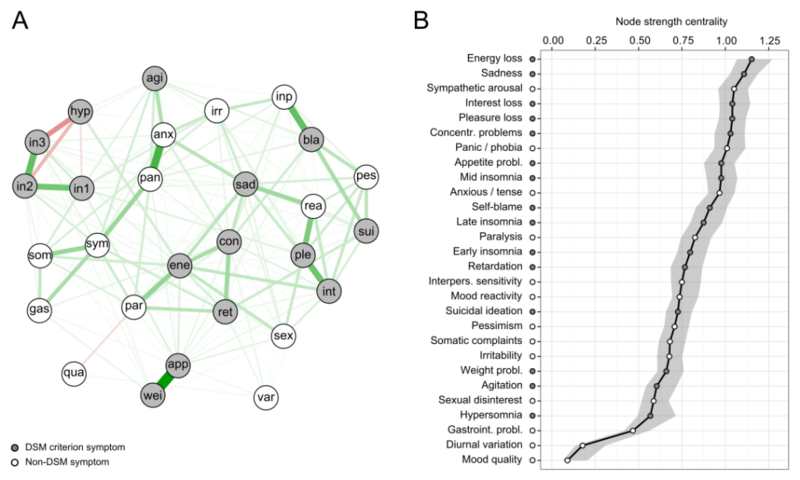 So we went ahead and estimated the network structure of 28 depression symptoms in about 3,500 depressed patients. We found that the 28 symptoms are intertwined with each other in complicated ways (it is not the case that all symptoms have roughly equally strong ties to each other), and symptoms differed substantially in their centrality values. Interestingly, both depression symptoms as listed in the Diagnostic and Statistical Manual of Mental Disorders (DSM) — as well as non-DSM symptoms such as anxiety — were among the most central symptoms. When we compared the centrality of DSM and non-DSM symptoms, we found that, on average, DSM symptoms are not more central. At least from a network perspective, this raises substantial doubts about the validity of the depression symptoms featured in the DSM. Our findings suggest the value of research focusing on especially central symptoms to increase the accuracy of predicting outcomes such as the course of illness, probability of relapse, and treatment response. Our new network paper “From Loss to Loneliness: The Relationship Between Bereavement and Depressive Symptoms” was published in the Journal of Abnormal Psychology (PDF). In the paper we examined 2 competing explanations concerning how spousal bereavement impacts on depression symptoms: a traditional latent variable explanation, in which loss triggers depression which then leads to symptoms; and a network explanation, in which bereavement directly affects particular depression symptoms which then activate other symptoms. We re-analyzed data from the CLOC study, a prospective cohort of 515 individuals, half of which would experienced spousal loss throughout the course of the study (the other half was queried as control group). 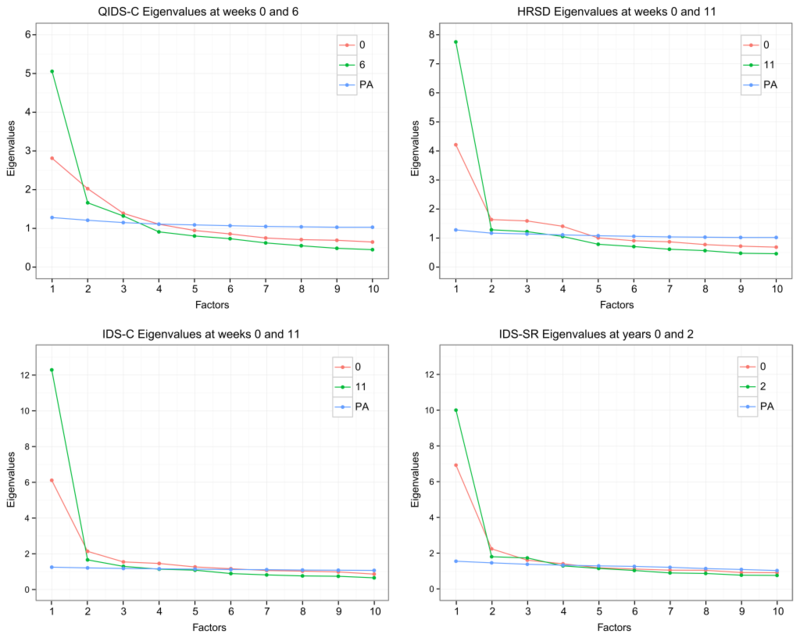 We modeled the effect of partner loss on depressive symptoms either as an indirect effect through a latent variable, or as a direct effect in a network constructed through a causal search algorithm. Our new study titled “Depression is not a consistent syndrome: An investigation of unique symptom patterns in the STAR*D study” was published in the Journal of Affective Disorders (PDF). In the paper we examine the degree of heterogeneity of Major Depression (MD). The DSM-5 defines a host of depression symptoms, which are commonly added up to sum-scores that reflect overall depression severity. This implies that depression symptoms are interchangeable indicators of the same underlying condition. It further implies that all patients with MD have the same disorder, justifying the search for things like “depression risk factors” and “depression biomarkers”. Therefore, we wanted to investigate how much depressed individuals actually differ in their symptoms. Using a conservative strategy to estimate profiles, we identified 1030 unique depression symptom profiles in 3703 depressed patients. 83.9% of these profiles were endorsed by five or fewer subjects, and 48.6% were endorsed by only one single individual. The results could have shown that most patients fit into a few common patterns, but the most common symptom profile had a frequency of only 1.8%. This substantial symptom variation among individuals with the same diagnosis calls into question the status of MD as a specific consistent syndrome. It stresses the importance of investigating specific symptoms and their dynamic interactions. Sum-scores obfuscate important insights, and the analysis of individual symptoms and their causal associations that is an important part of the ‘Psychosystems Project’ described on this website offers a way forward. Fried, E. I., & Nesse, R. M. (2015). Depression is not a consistent syndrome: An investigation of unique symptom patterns in the STAR*D study. Journal of Affective Disorders, 172, 96–102.